[Bellingham, Wash.] One of the most-anticipated elements of the Port of Bellingham’s airport expansion projects was unveiled yesterday to an enthusiastic group of travelers. The new baggage claim carrousel began operations just in time for nearly 300 passengers arriving from Las Vegas on Allegiant Air and Alaska Air. The two flights, about a half hour apart, have caused congestion in the baggage claim area in the past, when all bags came down a single baggage slide. Staff at the Bellingham International Airport said the new carrousel and the much larger baggage claim area worked smoothly. 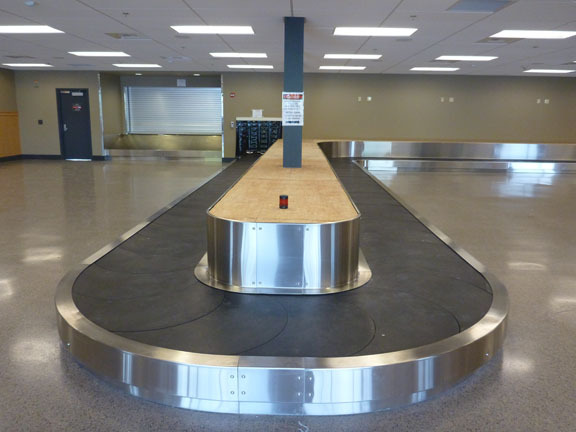 When the full airport expansion is complete in January 2014, there will be two baggage carrousels with an open and welcoming baggage claim area that should address crowding and congestion issues. In addition to opening the new baggage claim area yesterday, the Port also was pleased to open the final section of the expansion of the gate holding area. This section includes Gate A and an expanded area for Scotty Browns restaurant. The extra restaurant space includes more seating, office space and storage. When the entire expansion project is complete, the commercial terminal will be three times the size of the old terminal. The airport is not supported by property taxes. Its operational and capital expansion costs are paid for by airport users, airlines and airport businesses. The airport is operated by the Port of Bellingham, a countywide independent local government charged with pursuing economic development, operating transportation terminals and being a steward of public lands and resources. The airport is served by four commercial airlines: Allegiant Air, Alaska Air, Horizon Air and Frontier Airlines. Together the airlines offer non-stop service to twelve different destinations. About 700 people are employed at the airport working for airlines, aviation services, support services and ground transportation businesses. The port also operates most Whatcom County transportation terminals including the Bellingham Cruise Terminal, the Fairhaven Transportation Station (with Amtrak, Greyhound and Whatcom Transportation bus service) and marinas in Bellingham and Blaine. About 250 businesses operate in Port real estate developments.